I don’t know a lot about the Spanish Civil War, other than it was in Spain, and wasn’t that civil. It saw allied Communist and Anarchist forces fighting for the Republic face off against the Nationalists/Fascists. The Nationalists would eventually win, setting up Franco’s dictatorship which would last until his death in 1975. In the fight against Fascism several idealistic men from other countries traveled to Spain and volunteered to fight, among them English writer George Orwell, who would go on to find greater fame for his fiction works Animal Farm and Nineteen-Eighty Four. Orwell’s account of this time has been sitting on my Kindle for a while, and it’s something I’m quite interested in, despite my ignorance of the war. Orwell admits that this is by no means definitive for the war, and carries his bias, but argues that all accounts are and that he can only write about what he saw. 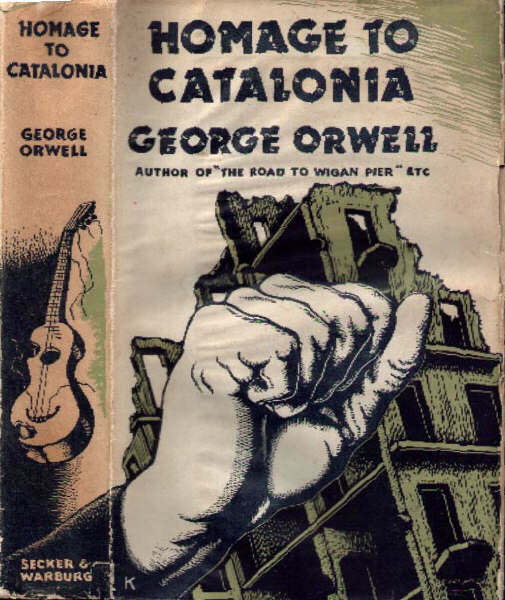 The book begins in Barcelona in the early days of the revolution, with Orwell waiting to travel to the front and admiring the spirit of the city. He then travels to the front, a period of monotonous discomfort and deprivation. Firefights are few and far between, and the general tone is of boredom and disillusionment. There is no glamour or heroism there, only a growing sense of futility and tedium. As the story progresses Orwell becomes increasingly frustrated by the poorly organized war and the failings of those in charge, as well as the rival factions which threaten the anti-Nationalist alliance and culminates in a period of needless street fighting in Barcelona. It’s an interesting take and Orwell is a fine narrator, addressing his own fears with a distinctly English tone and sensibility. Even in war he seems to expect a certain level of fair play, particularly with regards to the law, but as the organisation he joined is betrayed and outlawed he is forced to flee under the threat of imprisonment, which claims many of his acquaintances. I’m not naive, and I know revolutions aren’t conducted by pure hearted heroes, but it’s still disheartening to hear how petty rivalries undermine the cause and how quickly things in Barcelona revert to pre-revolution ways. I’m not a communist, but it’s clear how utterly depressing this must have been for Orwell and others, who fought for it and believed in equality, only to see that the class system had returned to Barcelona while they had been fighting on the front. The treatment of POUM (the party Orwell served) is especially tough, bad enough that they are sacrificed due to being smaller and less influential, the true tragedy is the fact that several of it’s members continued to fight and die in the war, oblivious to the fact they had been declared illegal and would face imprisonment when they returned home. It clearly infuriates Orwell, and it should infuriate the reader, even if they disagree with some of the politics. It’s a fantastically written book, with Orwell capturing his changing impressions and feelings during his time in Spain, as well as the mix of excitement and fear that seizes him during the fighting. His writing has a simple, vivid touch which avoids hyperbole but still brought the events to life for me. It paints an interesting image of the boredom, futility and surreal nature of war, best evidenced by the almost cordial relationship between Orwell’s unit and their enemy during the street fighting, where they broker a truce and even give their enemy a rifle to replace a broken one. It’s an interesting insight into a chapter of European history of which my knowledge is vague at best, I’m still keen to read more, but aware of Orwell’s self confessed bias this is a personal and absorbing account of one man’s experiences. Verdict: Well written by Orwell, who captures the mood and atmosphere well enough. Low on incident, but an honest representation of the often dull business of war. Interesting to learn more about the Spanish Civil War and the background machinations which would, in part, hand victory to the Fascists. An interesting read. 7/10.